Ayr United striker Michael Moffat has been charged by the Scottish Football Association over allegations of betting on games involving his own team. 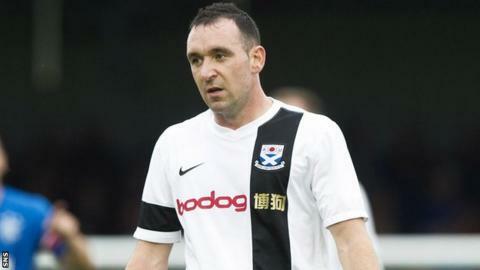 He is accused of placing seven bets on six matches involving Ayr as well as an additional 150 bets on other games. The SFA stresses there is no evidence to suggest Moffat has been involved in match-fixing or influencing results. Moffat, 29, has until Christmas Eve to respond to the charges, with a hearing set for Thursday 16 January. The SFA charge alleges breaches of disciplinary rule 33, which prohibits "[any] person under the jurisdiction of the Scottish FA [from] betting in any way on a football match (except authorised and registered football pools)". The rule breaches regarding bets on Ayr are alleged to have taken place between 3 August 2012 and 10 August 2013, with the others alleged to have taken place between 19 February 2012 and 1 September 2013. Earlier this year, Rangers midfielder Ian Black and banned for 10 matches - of which seven were suspended - after admitting betting on matches involving his own team.